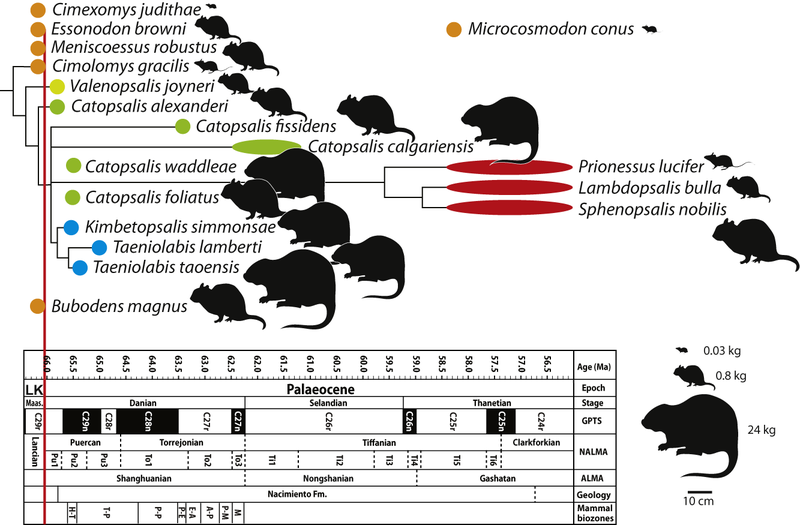 Multituberculates were amongst the most abundant and taxonomically diverse mammals of the late Mesozoic and the Palaeocene, reaching their zenith in diversity and body size in the Palaeocene. Taeniolabidoidea, the topic of this paper, includes the largest known multituberculates, which possess highly complex cheek teeth adapted for herbivory. 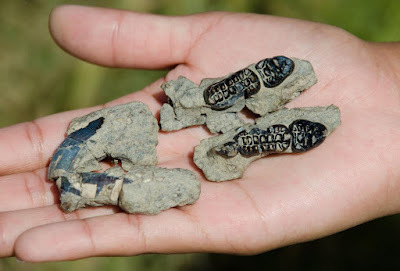 A new specimen from the early Palaeocene (middle Puercan; biochron Pu2) of the Nacimiento Formation, New Mexico represents a new large-bodied taeniolabidoid genus and species, Kimbetopsalis simmonsae. A phylogenetic analysis to examine the relationships within Taeniolabidoidea that includes new information from Kimbetopsalis gen. et sp. nov. and gen. nov. and from new specimens of Catopsalis fissidens, first described here, and data from all other described North American and Asian taeniolabidoids. 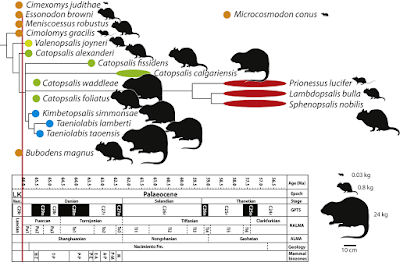 This analysis indicates that Catopsalis is nonmonophyletic and justifies our transfer of the basal-most taeniolabidoid ‘Catopsalis’ joyneri to a new genus, Valenopsalis. Kimbetopsalis and Taeniolabis form a clade (Taeniolabididae), as do the Asian Lambdopsalis, Sphenopsalis, and possibly also Prionessus (Lambdopsalidae). Taeniolabidoids underwent a modest taxonomic radiation during the early Palaeocene of North America and underwent a dramatic increase in body size, with Taeniolabis taoensis possibly exceeding 100 kg. Taeniolabidoids appear to have gone extinct in North America by the late Palaeocene but the appearance of lambdopsalids in the late Palaeocene of Asia suggests that they dispersed from North America in the early to middle Palaeocene. Holotype: NMMNH P-69902 from locality L-9181. The jaws of Kimbetopsalis simmonsae. Type locality and horizon: The specimen was discovered in the lower Palaeocene part of the Nacimiento Formation of the San Juan Basin of northwestern New Mexico, in the west flank of Kimbeto Wash, at locality 11 of Williamson (1996: fig. 18). It is from Fossil Horizon A and within the Hemithlaeus kowalevskianus – Taeniolabis taoensis Biozone (H-T Zone) (Williamson, 1996). The vertebrate fauna from this horizon is considered part of the type faunas of the middle Puercan Interval Zone (Pu2) (Archibald et al., 1987; Williamson, 1996; Lofgren et al., 2004). The west flank of Kimbeto Wash has yielded numerous taxa that are restricted to the H-T Zone, including Hemithlaeus kowalevskianus and Conacodon entoconus. These taxa are particularly abundant in H-T Zone faunas of the Nacimiento Formation, but are absent from the overlying Fossil Horizon B that yields the type faunas of the late Puercan Interval Zone (Pu3) (Williamson, 1996). Furthermore, no specimens of T. taoensis have been recovered from the west flank of Kimbeto Wash. This is important because the first occurrence of Taeniolabis defines the beginning of the Pu3 Interval Zone (Archibald et al., 1987; Lofgren et al., 2004). Although it does not in itself support a Pu2 age for the locality, the absence of Taeniolabis is further evidence that the west flank of Kimbeto Wash is not Pu3 in age (a time when other large taeniolabidids are known from the Nacimiento Formation). Specimen NMMNH P-69902 was found fragmented, but in close association, weathering from a silty mudstone in an area of low relief. There is no possibility that the specimen is float from a higher horizon and therefore we are confident that it is a member of the H-T Zone fauna, and thus is Pu2 in age. Etymology: Kimbeto, for Kimbeto Wash; psalis, ‘cutting shears’ (Greek). Simmonsae, after Nancy Simmons, in recognition of her work on taeniolabidoid multituberculates. 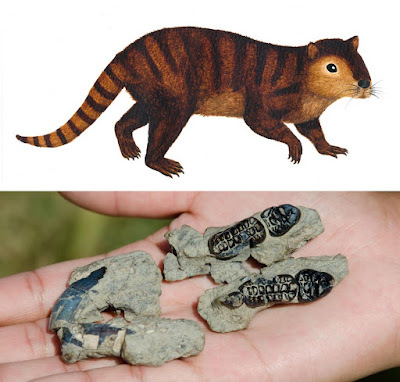 Etymology: Named after the late Leigh Van Valen, one of the 20th century's great mammalian palaeontologists, who studied Cretaceous–Palaeogene multituberculates (including ‘Ca.’ joyneri) and was a colourful inspiration to T. E. W. (who fondly remembers Leigh's visit to the NMMNH collections when he was a graduate student) and S. L. B. (when he was an undergraduate student in Chicago). Type species: Catopsalis joyneri Sloan & Van Valen, 1965. Distribution: Early Puercan (Pu1) of eastern Montana. The recovery of a new genus and species of large taeniolabidoid multituberculate, Ki. simmonsae, from the early Palaeocene (middle Puercan; Pu2) of the Nacimiento Formation prompted a revision of Taeniolabidoidea and an evaluation of their phylogeny and evolution. Our phylogenetic analysis of Taeniolabidoidea included all Asian and North American species referable to this clade. Owing to uncertainties over the choice of an appropriate outgroup we ran analyses using five different outgroups and found that trees were highly resolved using three (Cimo. gracilis, Men. robustus, and Mi. conus) of the five outgroups. In the highly resolved trees, species of the largest-bodied North American forms, Kimbetopsalis and Taeniolabis, consistently form a monophyletic clade as do species of the Asian Lambdopsalis, Sphenopsalis, and Prionessus. We here define Kimbetopsalis and Taeniolabis as the basis of Taeniolabididae and Lambdopsalis and Sphenopsalis as the basis of Lambdopsalidae. This study underscores the extreme rapidity of development of large body size and the increase in dental complexity within taeniolabidoids within the first 800 Kyr of the end-Cretaceous mass extinction (Wilson et al., 2012; Williamson et al., 2014). Taeniolabidoids evolved extremely unusual and highly specialized, large, chisel-shaped incisors and massive, multicusped cheek teeth for grinding vegetation and attained large body masses, exceeding 20 kg. The shifts to larger body sizes and increased cusp complexity strongly suggest a shift toward herbivory, and possibly folivory. Figure 6. Time-calibrated phylogeny based on the most-resolved consensus tree from our phylogenetic analyses. Each taxon is accompanied by a silhouette that illustrates the relative sizes resulting from our mass estimates (Table 4; skull length – m1 estimate). 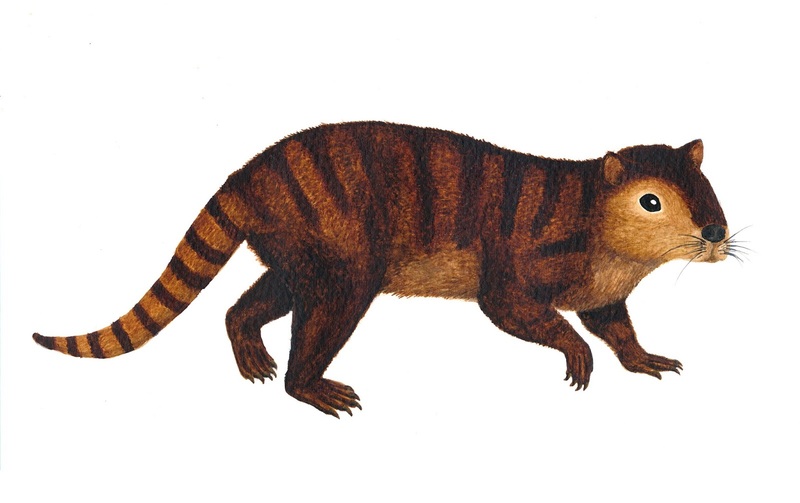 Bubodens magnus, the largest multituberculate and largest mammal of the latest Cretaceous, probably represents the sole Cretaceous representative of Taeniolabidoidea. Taeniolabidoids of the earliest Palaeocene faunas of North America include V. joyneri, which our phylogenetic analyses found to be the basal-most taeniolabidoid. We find that Kimbetopsalis simmonsae is the basal-most member of Taeniolabididae and it provides a plausible progenitor for T. taoensis, which first appeared in the San Juan Basin within the next 200 Kyr. Although taeniolabidoids disappeared from North America several million years before the end of the Palaeocene, they dispersed to Asia where they underwent a subsequent modest radiation towards the end of the Palaeocene, becoming extinct near the Palaeocene–Eocene boundary. ป้ายกำกับ: 2015, Mammalogy, Multituberculata, North America, Palaeocene, PaleoBiogeography, Paleomammalogy, Phylogeny, Prehistoric mammal, Revision, Systematics, USA, Zool. J. Linn. Soc.